There is common understanding that energy efficiency is a crucial piece of the puzzle to control climate disruption within the required timeframe, as well as to combine vital environmental and economic returns while increasing energy security. Yet investments towards energy efficiency appear to be lagging behind the actual development of financially viable technologies. If such efficient technologies are there, why do lenders and borrowers appear not to recognise the large potentials and easily accessible opportunities behind the simple concept that cost reductions immediately translate to cash-flow and profit generation? 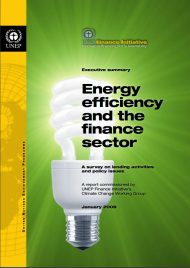 This survey explored how financial institutions are already dealing with the energy efficiency concept and what the reasons are for a lack of dynamism in this field. It provides an evidence base that highlights the steps that private as well as public lenders and policy-makers can take to better exploit the vast potentials of energy efficiency in an increasingly energy- and carbon-constrained world.